Florida Gov. Ron DeSantis, coming off a contentious campaign dominated by allegations of racism, touted his African-American appointees during a Martin Luther King Day speech at a historically black church in South Florida. Ron DeSantis was accused on the campaign trail of courting bigots. Now, as Florida's governor, he's courting African Americans. Coming off a contentious campaign dominated by allegations of racism, DeSantis touted the diversity of his administration Monday during a Martin Luther King Jr. Day speech at a historically black church in South Florida. In an event intended to promote his plan to expand school vouchers, he also highlighted his minority hires for top posts. "I don't want to just be putting people in from some good ol' boys network. I want to be putting people in from all walks of life," DeSantis told a largely black audience gathered in the sanctuary at First Baptist Church Piney Grove in Lauderdale Lakes. "And I think if you look at my total appointments, I don't think there's any peer recently, at least in Florida, of the number of African Americans we've put in." DeSantis, a Republican former congressman, noted his appointment of Ken Lawson to lead the Department of Economic Opportunity, Jamal Sowell to oversee Enterprise Florida and Simone Marstiller to run the Department of Juvenile Justice. He was flanked by Gregory Tony, whom he appointed this month as the first black sheriff in Broward County's history, as he descended from the sanctuary's second floor and walked to his pew. Said DeSantis, "It has nothing to do with race. I'm looking for the best people. But I'm not just going to fall into this rut of only choosing from the same little pool." 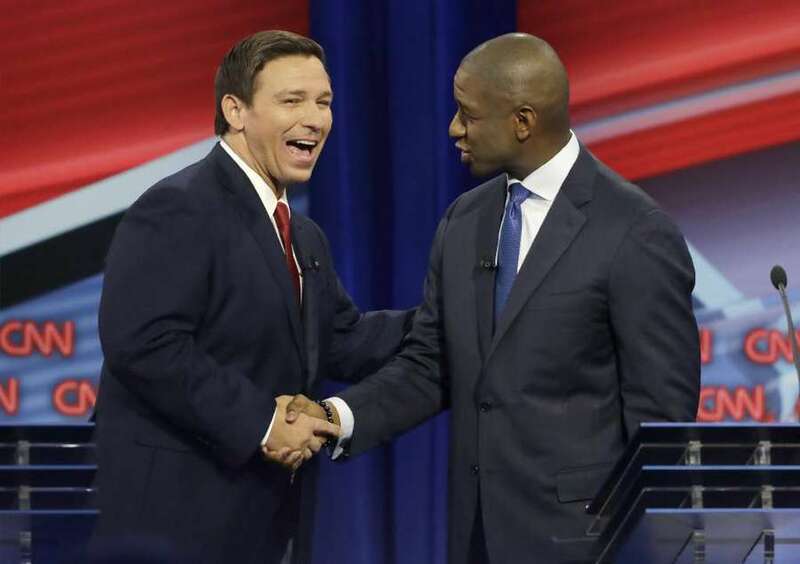 DeSantis frequently defended himself on the trail against allegations of racism after an early controversial statement that voters would take the Florida economy and "monkey this up" if they adopted Gillum's liberal policies. He was criticized for previously attending conferencesorganized by an activist who has said that black people owe their freedom to white people. He denounced an out-of-state neo-Nazi group that distributed racist robocalls and returned campaign contributions from a donor who, according to POLITICO, used a racial slur while referring to Barack Obama on Twitter. "I'm not calling Mr. DeSantis a racist. I'm simply saying the racists believe he's a racist," Gillum said during the opponents' final debate. On the day he was sworn in, the Florida Supreme Court was left without a black justice for the first time in 36 years when Justice Peggy Quince was forced to retire due to age limits on the state's high court. Guaranteeing that the court would remain without a black justice for the foreseeable future, a judicial nominating committee comprised of Rick Scott and Florida Bar appointees bypassed the six African-American court applicants when finalizing a menu of final options from which DeSantis was allowed to choose. Sen. Oscar Braynon, an African-American Democrat representing parts of Broward County, said he's encouraged by DeSantis' minority appointments. But he added that a lot remains to be seen and done when it comes to supporting Florida's African-American community. "I reserve judgment in saying that we just elected the new Martin Luther King or that he's going to be as good for black people as Barack Obama until I see a little more substance on policy," Braynon said. Though constitutionally protected, the state's tax-credit vouchers have been criticized by teachers' unions and Democrats as a means for transferring public funds to private institutions and undercutting public education. But DeSantis argued that the vouchers are a key aspect to ensuring equality of opportunity to families in low-income communities, and said he wants to expand access to the vouchers in a way that would eliminate a waiting list that the nonprofit says is nearly 13,000 students long. Speaking to the Miami Herald reporter after his speech, DeSantis said voters rejected allegations of racism as "typical political nonsense." "On the campaign I was very clear; we're working for everybody," he said "And I think I've obviously done that in this administration."